This afternoon my children start the long summer break from education. My daughter will leave her nursery years behind and begin her formal education in August and my son will have completed his first year at school and will say goodbye to his teacher for the last time as she moves to another school. Except, unlike most children, neither of them have any idea what is going on. For ten months Isaac’s life has been consistent. He has spent 6 hours a day at school wearing his beloved red jumper and being with the same four other children and staff. 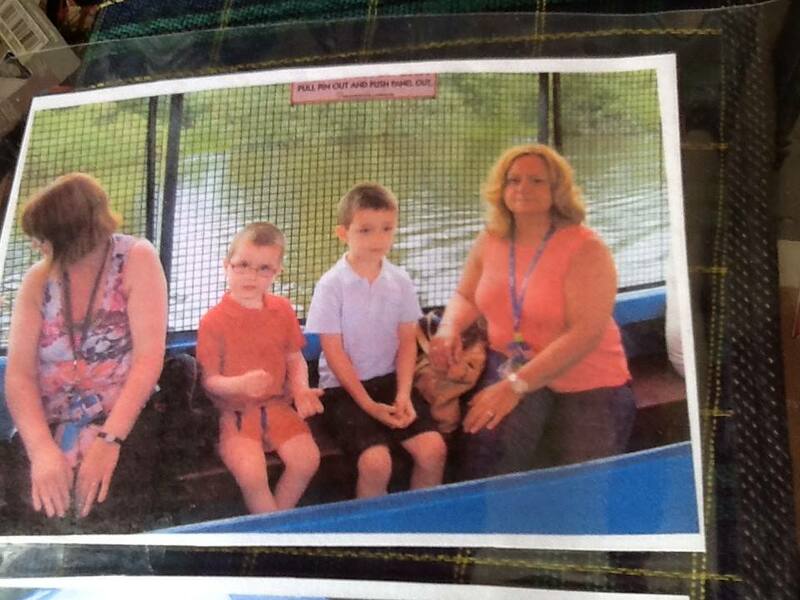 He has grasped the routine of swimming, sensory room visits, school dinners and outside playtime. He has become accustomed to going on a taxi journey every morning. He has no concept of holidays at all so seven weeks without this consistency and routine will really confuse him. He will still insist on wearing his red school jumper, because that is what he always does. 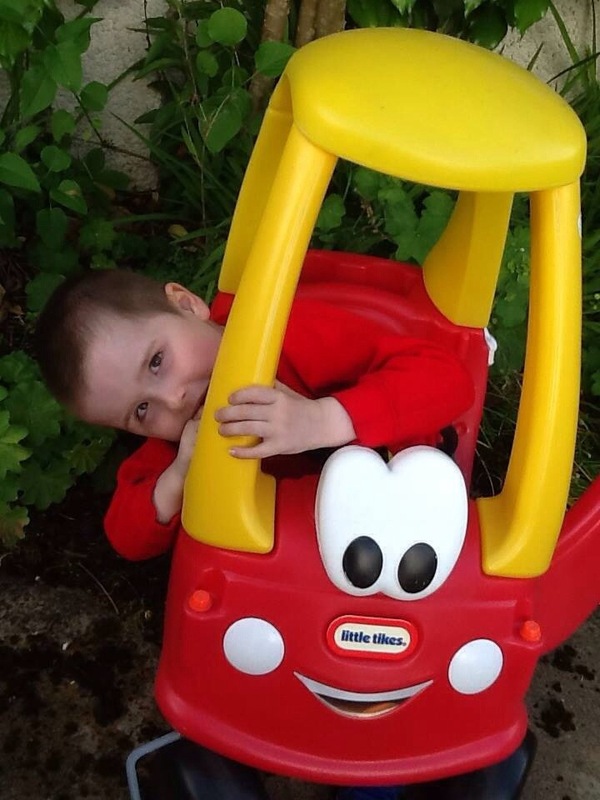 He might be on holiday from school but he won’t get a holiday from his autism, or his learning difficulties, or his neurofibromatosis, or his developmental delay. And we won’t get a holiday from them either. By the time he has adjusted to any new routine of being at home, going trips out, or eating lunch at home, it will be time to start preparing him for his return to school. While his teacher, speech therapist, support workers, and even his respite carers all get a summer break, we, his parents, have to become all of the above and more in order to keep his development on track and continue to encourage his communication. Except, unlike the professions, we don’t get a full nights sleep, or a wage, or have access to wonderful resources. We get to do it without training, support or a break. We do it out of love. 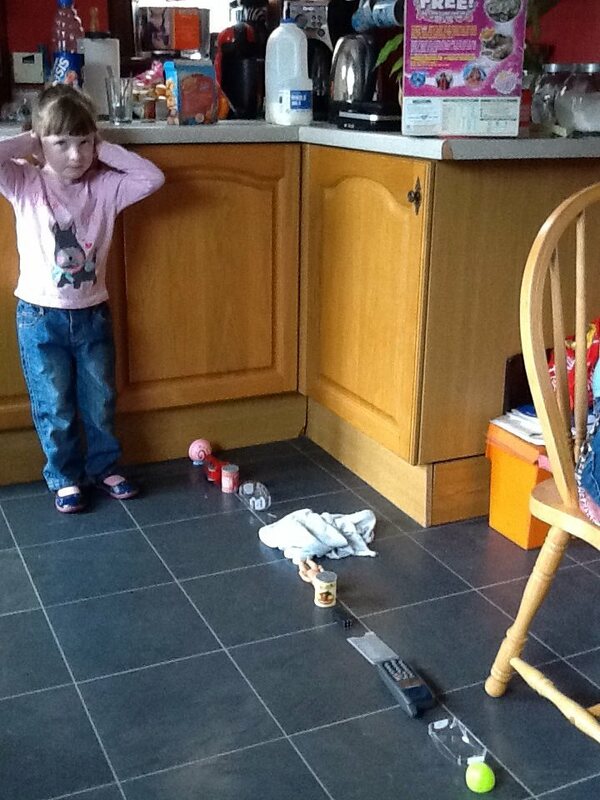 For three years now all Naomi has known is nursery life. We have read books about school, she has had a few visits, she has seen photos of what her brother has done at school, and we have her new uniform and school bag ready. 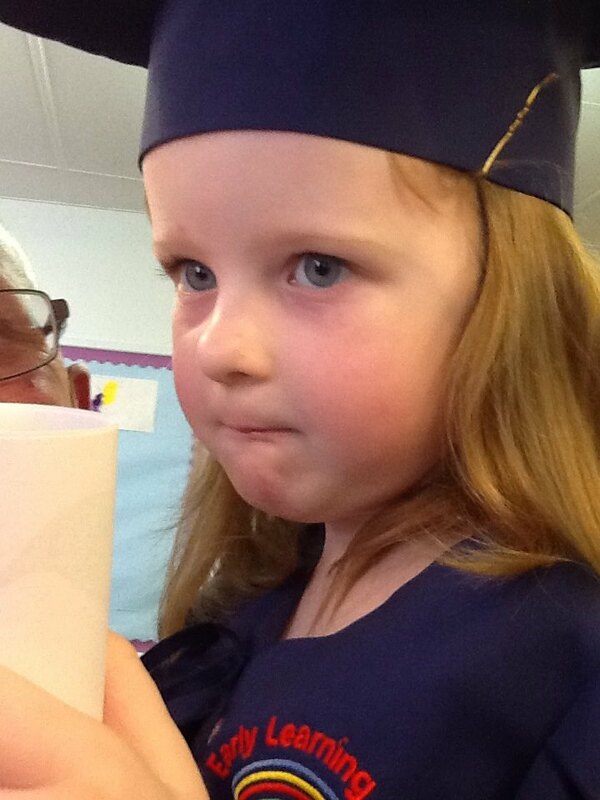 But still she asked yesterday morning what would she do when she no longer goes to nursery! Because until the reality of starting school happens she can not ‘imagine’ herself doing anything different. Like all 5 year olds she lives in the moment. Seven weeks away is like years away to her. As she hears all the staff saying goodbye, as she hands them presents to say thanks, as she empties out her tray of all her art work and letters, she still hasn’t fully understood that she won’t be back there again. As adults it can be hard to think what any new routine will look like and it can take time to adapt to changes. It will seem strange for me not to hang her coat up on the peg we have used for years now, to put her slippers in her bag for the last time or to drive out the car park knowing I won’t be there again. I find it hard to imagine my tiny five-year old will be wearing a shirt and tie or school pinafore in just a few months time. This change is big for me, so it is huge for my daughter. So we say goodby to her key worker, her learning support teacher, her speech therapist, her assistant Head and Head teacher. I look at their faces and realise just how many meetings we have attended together over the years, how many times we have discussed my daughters difficulties, how many strategies we have worked on together and how many forms we have all filled in. They now get a holiday from all this. And while we may get a break from meetings and discussions with all these professions, and many others beside, we will still have to work on communication strategies, self help skills, independence, gross motor development and toilet training throughout the summer. Once again we will be working on all these without training, support, sleep or access to the resources they have. Naomi’s challenges won’t disappear for the summer. In actual fact they may become more pronounced as she struggles with the lack of structure, becomes more social isolated due to not being around her peers and becomes even more attached to me and therefore more anxious when she is apart from me. 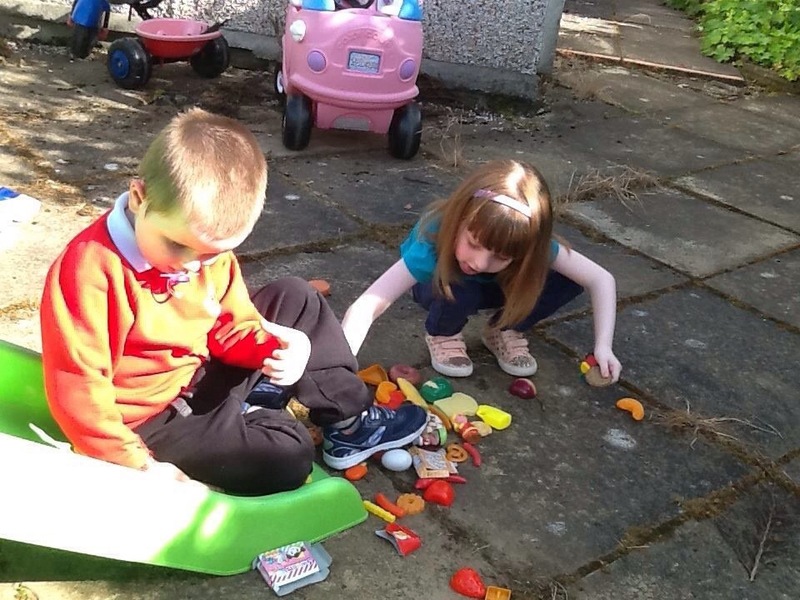 While she will be delighted to not be forced into social situations or have to join in with others, seven weeks of being allowed to play on her own, being restricted by the needs of her brother, never being away from me and not being challenged in her communication with others will have a big effect on her confidence socially and in her general development. While I will do my utmost to keep my children entertained, stimulated and happy throughout the summer I also need to keep working on their communication and social skills and their physical and mental development. And we still have hospital and clinic visits throughout as well. Except now we have to take two children along to them all. I know all the professional who have worked with my children this year deserve a break. I know it is good for my children to have a rest from formal education too. But while they all begin that break at 1pm today the batons gets passed to me and my husband. Seven weeks of no speech therapy support; no breaks while the children are at school and nursery to get on with paperwork, housework or shopping; no respite; no school meals; no access to the support and resources his school has to offer; and no extra funding to provide any extra support the children need. It’s the end of term here in Scotland which traditionally means schools and nurseries relax the rules a little bit, organise sports days and school trips and have end of year awards ceremonies and graduations. Parents love them, teachers spend more time decorating rooms, organising teams and taking photographs of children than they do teaching, and social media fills up with post after post of proud parents posting of their child’s achievements. But for some children, my own two included, all these changes bring stress, anxiety and confusion. My children don’t excel in sports, or academics. School trips makes their anxiety levels soar. And the relaxing of the rules is so confusing for them both. So while parent after parent takes pride in their child winning races, telling them all the details of their school trip or enjoying all the wonders of this years school fair, I rejoice in the simple fact of my child taking part. 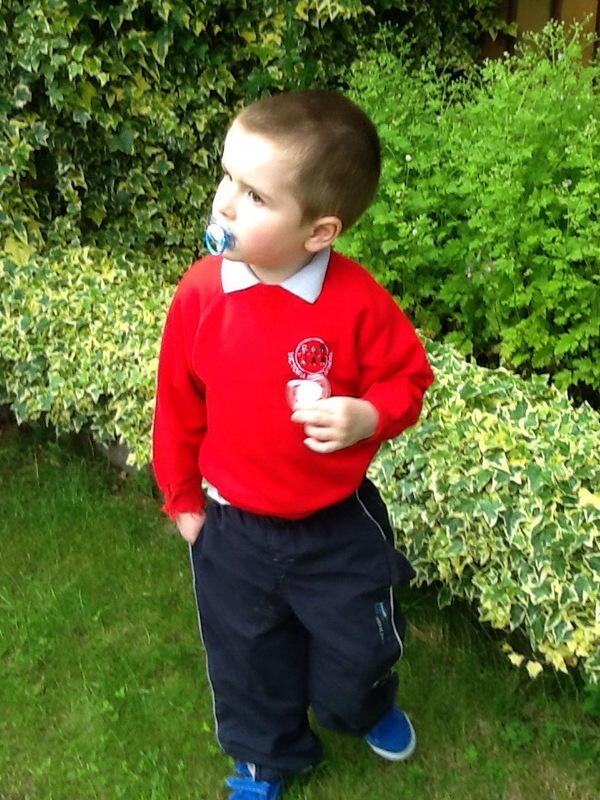 Isaac had his first ever sports day at his special needs school last week. I knew he had been preparing for it when his legs had even more bruises than normal on them and he came home upset. They sent me home a photograph of his assistant helping him bend down to pick up something in a race. I have no idea what else when on that day. But I do know he took part in some of it. And that makes me incredibly proud. He has no concept of sport, or competing, or what he was supposed to do. He would have been much happier running around the hall flapping in circles. But with constant support he took part. It was a struggle for him and his teacher. But they tried. And that was worth getting a gold medal in my book! He had his first ever school trip this week. His class of five children went to the safari park. But his taxi arrived that morning and it was a different colour, and his beloved food catalogue wasn’t there as it was in the other car. No catalogue, wrong car and the added confusion of a ‘different’ day were all too much and it took thee adults to carry him into the taxi kicking and screaming. I should have stood outside the school gates waving him away on a bus like every other parent of a child in mainstream school. Instead I was still hearing his crying as the taxi pulled away from our street. My heart was broken seeing him struggle so much. And knowing he can not come home and share with me the joys and excitement of his day because he can not speak. He came home with three photographs in his bag. The tears of pride I had when he chose to sit on my knee and point to those pictures. That was worth the struggle to get him into that taxi. 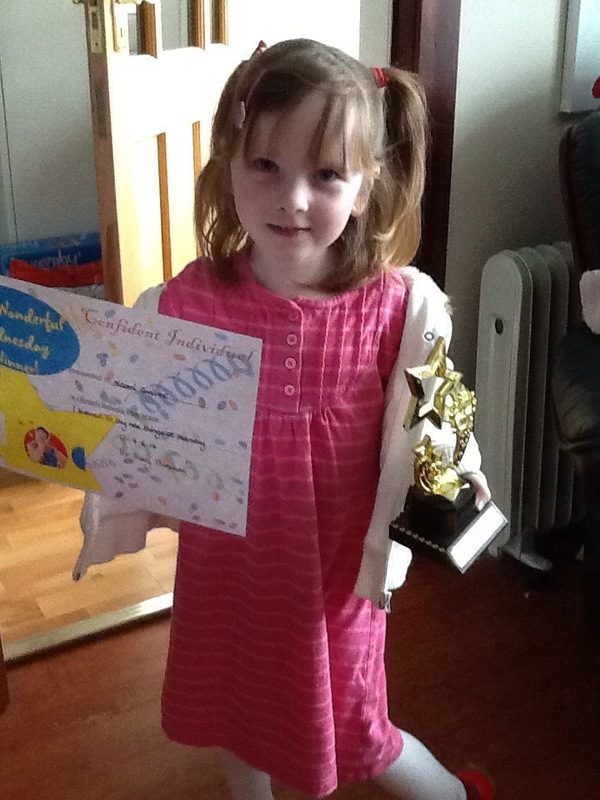 Naomi had her first sports day at nursery last week too. 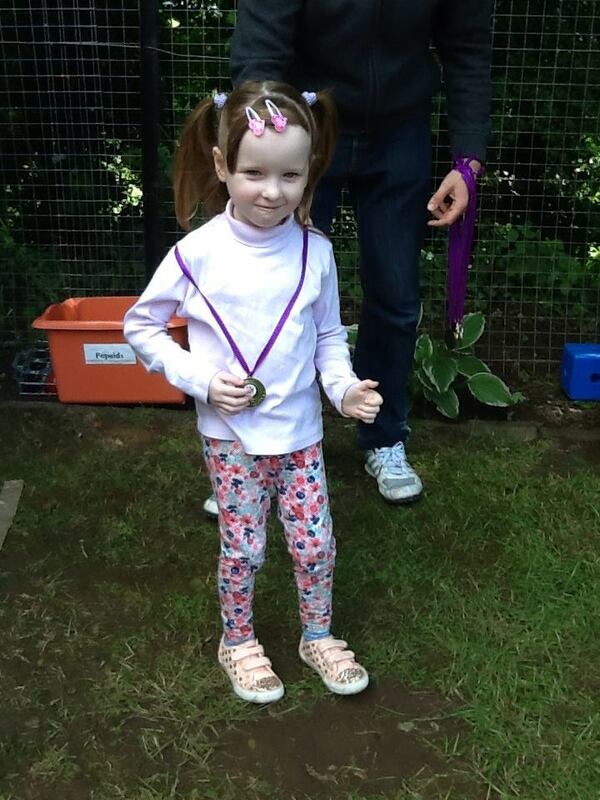 As all the other children independently came out of the class and down the three stairs into the garden she had to be supported by a member of staff. As all the others formed a line and filed into rows of seats she just stood there. She had no idea of the social ‘rules’ going on so could not follow them. She had to be seated on the last seat away from her friends. As the races began her face went paler and paler. As she watched children run across a small section of garden, she looked so lost and was huddled into the rows in front by staff and pupils alike like a little lost sheep just following the crowd. When it came to her race she never moved until the word ‘go’ was said and she ran as fact her little legs could go, which isn’t very fast at all. The others finished and the next group were all lined up but she wasn’t even at the finish line yet. The tears in my eyes were a mixture of sadness, pride and overwhelming love all rolled into one. 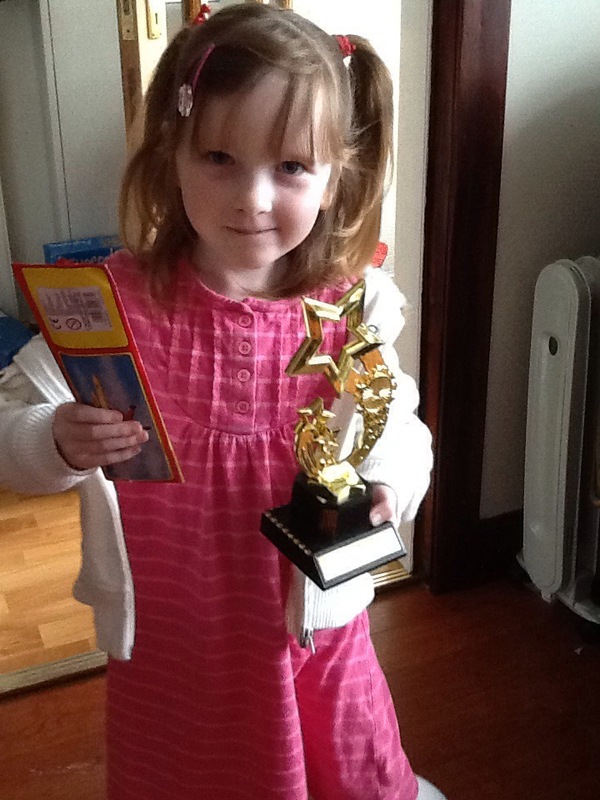 The staff and parents cheered her on like she was one of their own. And finally she made it. The others full of energy while she was exhausted from just one short race. With difficulty and support she completed every race in a similar manner! Last by a long way every time. Thankfully there was no sack race or hurdles as she still can’t jump. As all the children received medals and had pictures taken there was a massive round of applause for my daughter as she stepped forward to get hers. We had all watched her struggle. And we all celebrated her victory. This week she struggled again. 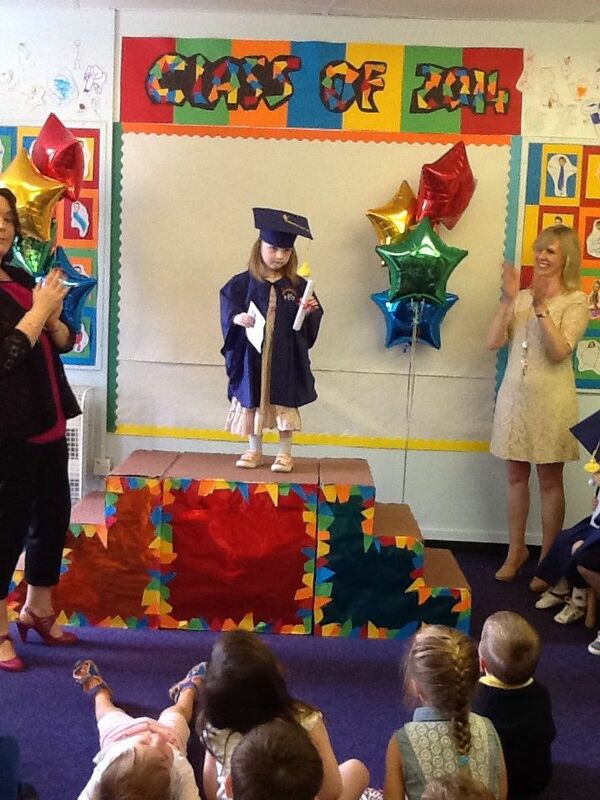 This time it was the nursery graduation. The hat and coat annoyed her so much. The noise of all the children and adults was so loud for her. The heat in the room made her feel sick. But she sang, she watched videos of everyone’s time in nursery, and she clapped for the other children receiving their certificates and school ties. All the while her face was getting paler and her hands were moving more in front of her showing her anxiety. 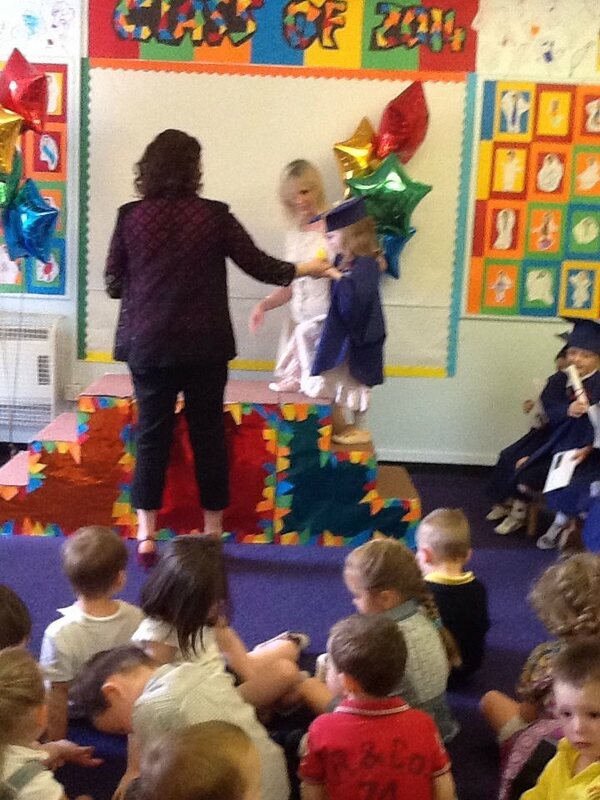 As all the others jumped excitedly onto the made up stage she needed two members of staff to support her up. She stood at the top terrified. But she did it. I can not begin to tell you how proud I was of her. At that moment it didn’t matter one bit that she doesn’t speak there, or that she is still wearing a nappy, or that she has autism. At that moment in time I was so proud of her for getting to that point, for overcoming her struggles and taking part. Tomorrow we have Isaac’s end of term celebration at his school. I know he will struggle. But I know with support he will get through it. It is hard to watch your child struggle. But it is even harder for them. Sometimes courage can be found in children who are trying hard to take part despite everything. They say it is the taking part that counts. And even though Naomi has had nose bleeds, fainted,and cried with it all this week and Isaac has bit himself, screamed and gone deeper into his own world as a result of struggling with the changes end of term has entailed, they have both made me so proud. I watched my children struggle. But I watched them overcome too. It’s been a year of struggles but also a year of breakthrough. Life really is about taking part. Because for many children, like mine, that is an achievement all on it’s own. Another afternoon spent at hospital with my 5-year-old. Another trip to the eye clinic. We are on first name terms with the lady at the desk now. She doesn’t even look at the name on the appointment card as we hand it to her. She ticks my son’s name off on the list without even giving it a second though. He’s become a ‘regular’ now. We are well versed in the hospital and clinic drill. We know when parking is going to be an issue and drive straight past the visitor car park and right into the overflow one without the previous six circles around looking for a space we used to do. We have long stopped looking at the signposts directing people to wards, clinics and hand washes. So this time we think we can risk taking the 5-year-old in without his mobility buggy. He knows the drill now. And despite hospitals apparently being one of the most disabled friendly places around, believe it or not, the chairs in the clinic are all nailed to the floor in rigid rows with no space for wheelchairs or buggies of any sort! My son can walk, physically anyway, and he is able to sit on a seat. So it has to be easier if we walk him in. As he flaps and vocalised towards the front door I suddenly realised we had our first problem: automatic doors! Isaac loves them and is never content to just open them once…or twice…or forty times. He could happily be entertained by them all day and all night. The clinic is on the ground level so there is no enticing him along using a lift as an incentive. Not that he would get in the lift anyway. No, he would just want to watch the doors open and close all day there too. I ended up carrying him. He is two-thirds of my height now and almost a third of my body weight. And if he does not want to go somewhere…well he won’t make carrying easy! What was I thinking leaving that buggy in the car? We arrived at the clinic exhausted before we even started. I should have guessed it was going to be one of ‘those’ appointments. You know, the ones you think seem never-ending. The ones where the clock on the wall forgets to move and everyone else leaves when you seem stuck to the seat. Yes, those ones. Isaac sat hammering on the sponge seat back laughing at the noise. At least he seemed happy enough. He had to be carried into the first room. They tried and failed to get his attention. Until they put those dreaded drops in that is. Non verbal does not mean compliant! We had a choice of waiting in a boring waiting room for half an hour with a five-year old with complex needs who now had stinging eyes and blurred vision or we could leave the clinic and return in 30 minutes. Moving the car was not an option or it would take longer than the 30 minutes to find another parking space. Isaac had his own plans. He ran straight back to those automatic doors again! Watching him flapping, clapping and spinning at those doors and gradually getting more and more confused as he could no longer make out the exact point of them opening and closing due to his vision slowly failing, made me suddenly realise that I was no longer just a parent to this boy. I had long passed that point. I was now his mummy and his full-time carer at the same time. He was my son, yes, but he was also in need of much more care than any ordinary child his age. Though his eyes were struggling, mine could see clearly. This was a child with needs so severe he will need life long care. I was so relaxed in this hospital setting from so many visits that it seemed like home. My husband walked over and said he had noticed a table with some people at it. We had walked right past it. So preoccupied were we with watching out for the needs of our son, that ironically we had walked right past a table of leaflets and handouts for carers! Are we parents or are we carers? Or can we be both? We have two children registered disabled. My diary is full of appointments for hospitals, clinics, home visits, and meetings. I spend my week carrying out speech therapy, play therapy, writing social stories, making visuals and making sure we have mashed potato in. Both my children have teams of professionals involved in their care and support. I am still changing nappies on 5 year olds. 20 minutes ago I just had to carry my child kicking and screaming down a hospital corridor because he refused to leave the automatic doors. I guess we should check out the carers table then. Society may not see me as anything more than a mummy. Until recently I would have seen myself as more of a mum than a carer too. I look after my children because I love them, like all mums do. But very few five-year olds still need to be changed like a baby. Very few five-year olds have no speech. Few five-year olds have the complex medical and developmental needs of my son, or the high anxiety of my daughter. Thankfully not many five-year olds require teams of professionals to support them everyday. 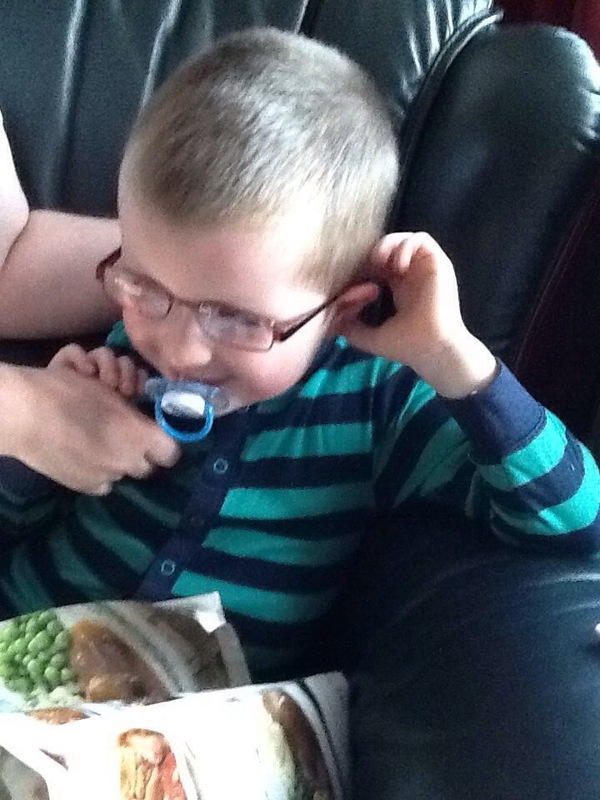 Isaac was given glasses this week. Lots of five-year olds have glasses. But for me this was the final thing that made me realise I have definitely moved from just being mum to my children to also being their carers. It was amazing how many people checked out that carers table. Today I was one of them. 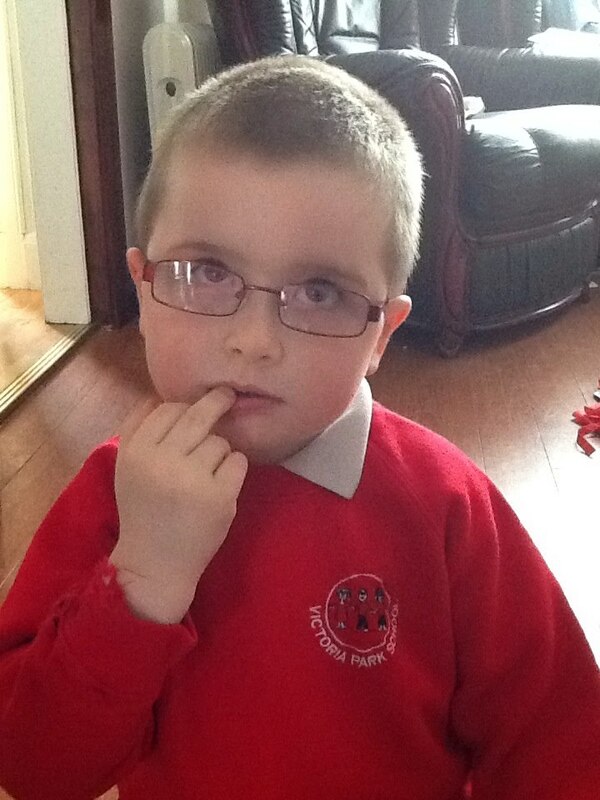 A trip to the eye clinic for my son has helped him see clearer. But it also helped me see clearer too. “The only real mistake is the one from which we learn nothing” Henry Ford. For the last 8 weeks my daughter has been trying to learn a new skill. It is a developmental milestone that almost all children her age have already mastered years before. Through many strategies and joint working with professionals, everyone involved with her has been working on similar goals. We wanted her to succeed. Everyone wants their child to succeed. But at a meeting yesterday it was decided that it would now be in her best interest to stop all the current aims and accept that this particular skill will be worked on another time. It appears on the surface that she has failed. But she hasn’t. Perhaps us as adults failed her by having expectations she could not achieve? Maybe. But in my family I won’t accept failure. My son is 5 and has yet to master skills that 12 month old babies can achieve easily. His school is celebrating the fact he can point to something topic related in a book. He gets a star on a chart for turning his head when his name is called or giving brief eye contact. Success for him is taking his own shoes off, or recognising his own photograph. This is just where he is at. Set goals for him that most children his age can do like riding a bike, or writing or reading and he will fail. He can’t even hold a pencil and is only just mastering the basic skill of turning one page at a time. I would never let his school set goals for him that were totally unachievable. Stretch him and push him, yes of course! Set tasks that we know from the outset are way above his ability, no chance! He has to experience success and a belief that he can do things. He may not win any races in sports day this week but that means nothing to me. In my family I won’t accept failure. My husband took 8 attempts to pass his drivers test. I failed my final year at university and had to repeat one of my placements. In all my years at school I was never once the top of the class. I was, and still am, dreadful at sports. I was in the bottom class at school for French. In so many ways you could say I have failed. Even this week I received an email from an agent saying that something I submitted to them had not been accepted. I have lost count how many dinners I have burnt over the years. But none of these make someone a failure. To be a failure you have to stop trying. You have to give up getting back up. You have to no longer learn from your mistakes. You have to accept yourself as a failure instead of seeing failure as part of the rungs of the ladder of success. Failure is letting it define you as a person rather than saying ‘I may not be great at that but I am good at other things.’ Failure is quitting. And for those reasons I won’t accept failure in my family. It is unlikely as adults we will get a reward for failing our driving test, or for not reaching that bonus in work, or for struggling to build that flat pack wardrobe. There might be no-one to cheer you on when you appear to fail at work, or in a family situation or in a sports event. You may feel you have failed as a parent because your children are not reaching milestones when others do, or they didn’t do as well in exams as you hoped, or they are living a life that isn’t quite as you planned for them. But in all these, and more, you are learning and others are learning. And the more you fail the closer you are to success. I refuse to let failure define my children. Childhood is not a competition to see who can always be first to do something or get the highest grades or gain the most trophies. Childhood is a magical time to learn and grow at the pace that suits each child. In going that bit slower my children are learning to appreciate all the little things in life, and so am I. I am learning ways to facilitate them and protect them more. Their trikes have no pedals on them since neither of them can pedal yet. We use large footballs that are easier to catch and kick. We practice letter formation using our fingers with an iPad rather than using a pencil as it is easier just now. We use signs and photographs to communicate when there are no words. Failure gets turned to success at every opportunity. Because self-esteem is something of major importance in my family. Trying counts for everything. It is only if none of us try that we will have failed. Many will tell my children they have failed. But I will never let them believe they are a failure. Because I won’t accept failure in my family. And I am proud of my children for trying and taking part even if they never come first.